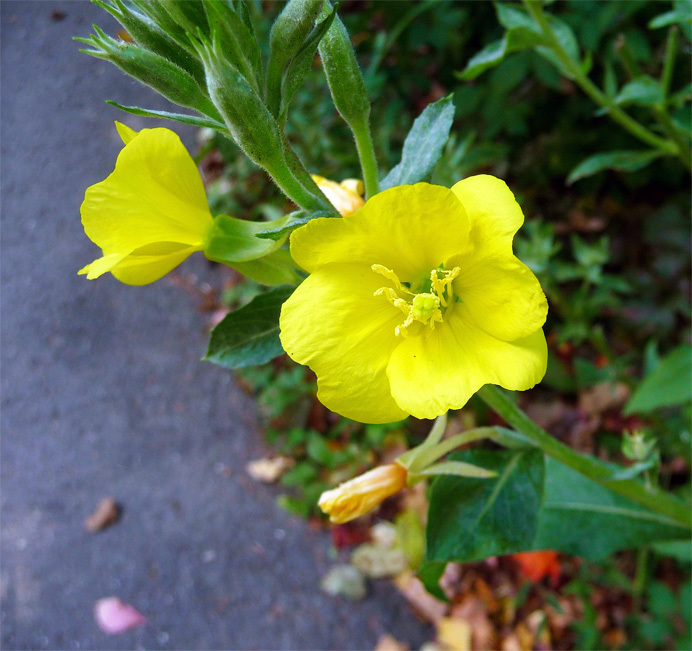 Walking along Middle River Road today, I found this evening primrose (Oenothera biennia) blooming. The flower normally opens at twilight, when the plant is pollenated by moths and bees specialized to handle the sticky threads connecting its pollen grains. (You can see the threads in this picture if you look closely.) In cool weather like today's, however, you can find it blooming in deep shade. Also known as Fever Plant or King's Cure-All, Evening Primrose is said to have dozens of medicinal purposes. Some are clinically proven: a rare oil in its seeds, gamma linolenic acid, is used against premenstrual syndrome (PMS) and shows promise against breast cancer. The plant is also edible. American Indians boiled its peppery roots like potatoes. People today use the shoots in salads. (I've never tried them; have you?) .